In celebration of Earth Day, the Peralta Community College District hosted the 11thannual EcoFest Sustainability Festival at Laney College on Thursday, April 20, 2017. The festival featured over 100 groups including live music, dancing lessons, local programs, environmental companies and non-profits, exhibitors featuring sustainable goods, and food trucks. 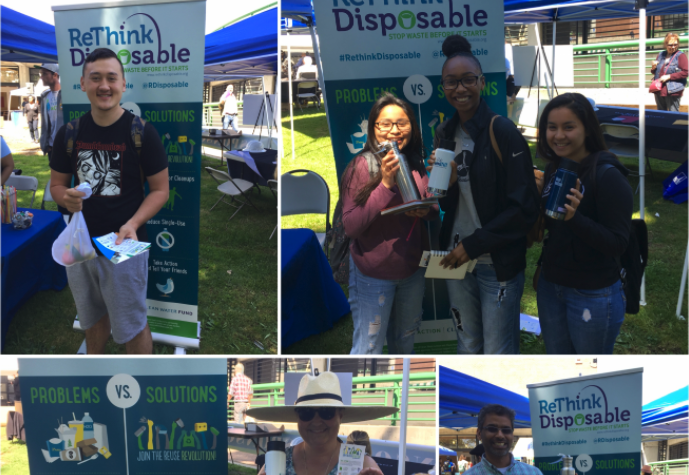 ReThink Disposable participated as a sponsor and educated and engaged the campus community at a booth to showcase the results of the Laney College campus litter study that Clean Water Action conducted with 55 student volunteers in March, 2017. Our goal was to identify sources of trash on campus in order to stop litter before it pollutes Peralta Creek, which flows through the campus and drains into the San Lorenzo Bay, a designated trash-impaired hot spot in the city of Oakland. In just one hour, over 2,600 pieces of litter were collected, including 122 straws and 150 bottle caps! The results of the study revealed that most of the litter found on campus originated from sources outside of campus and primarily is comprised of single us disposable food and beverage packaging and cigarette butts. . After learning about the sources of litter and how it creates pollution in our environment, dozens of students, faculty, and community members took the ReThink Disposable pledge to reduce their use of single use disposables by switching to reusable alternatives and refusing them all together like straws!